Can you believe it's almost 2011 already?! Wow! This year has flown by. I know I say that every year, but really, this year has just zoomed. Does that have anything to do with having a now teenaged daughter? Hmmm, I'm thinking that has a LOT to do with it! Ha! We're spending a quiet New Year's Eve with some dear friends and for the first time in 13 years, we are childless on New Year's Eve! Yep, Emma is off to her first ever All-Nighter Lock In with the youth group at church and our friend's daughter (her bff) is with her. What's really funny is that we four adults had the hardest time deciding what to do with ourselves! We finally decided on a quiet dinner at their home with board games and the ball drop at midnight. I'm sure we'll be dropping by then too! Haha! I'm too old for an all-nighter! So now you know my plans for the evening, how about a card? Yep - I do have one for you, and it's a doozy! I had such a hard time with this sketch! It's kind of busy and that little tag element just really threw me. So, I went with my gut and changed it up a little bit, but it still looks kind of crazy to me. Yep, crazy love. Catchy, eh? I did get the chance to pull out my Big Shot and the Letterpress Plates for this one, and truth be told, I really liked working with it. Very easy and I love the look! I used it on the belly piece with Real Red Craft ink on Pretty in Pink cardstock. It's hard to see in the photo, but the letterpress plate created a red de-bossed image on the cardstock - very cool! The DSP, Filled with Love stamp set and the little clear Bitty Button are from the Filled with Love Bundle Special that SU! 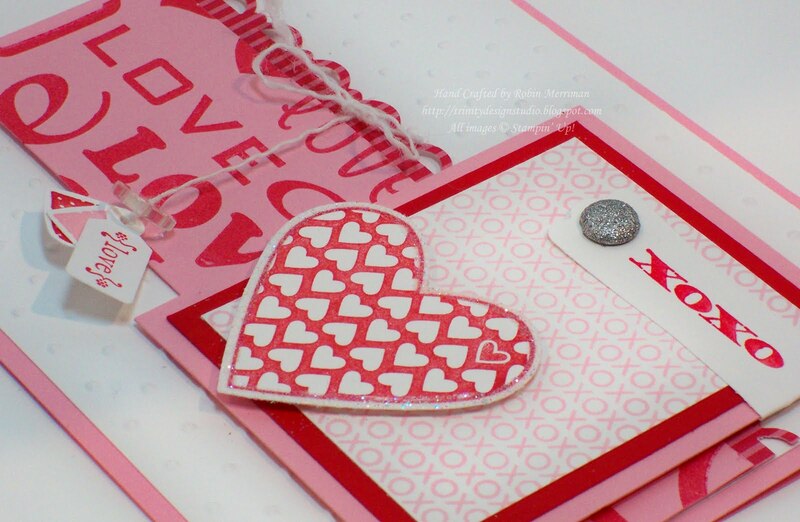 has going on right now - I used the tiny heart and the large heart from the stamp set. The XOXO greeting and background stamps are from the stamp set of the same name and it's a sneak peek from the upcoming Occasions Mini Catalog. 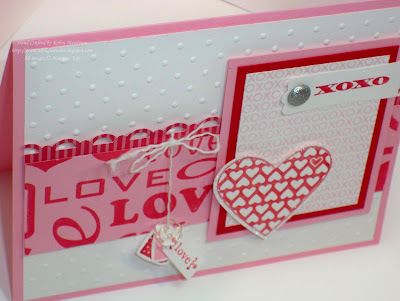 The love tag is from the Tiny Tags stamp set and I used the Small Heart Punch, Medium Jewelry Tag Punch, the Large Heart Punch, the Scallop Trim Border Punch and the Modern Label Punch on this card. Wow, 5 punches, hmm, didn't realize I'd done that until just now! Love me some punches! So, about 7 Stampin' Dimensionals gave their life for this card along with a Silver Glimmer Brad and some Dazzling Diamonds Glitter. The only thing non-SU! on this card is the white thread - a gift from my friend Kimberly. It's antique white twine that she discovered on a bolt in an antique store and so generously gifted me with. Maybe SU! will get some white thread someday! So, did I mention that there's a lot going on with this card? It's probably because of the ungodly hour that I concocted this creation - 6:22 AM. It was too noisy to sleep last night - don't ask - so I was up early, making coffee in my Keurig and trying to decipher this sketch. No wonder it's crazy love. Busy, crazy, but the question is, do you like it? I'm anxious to see what the other Stamping 411 Operators came up with for this sketch, how about you? 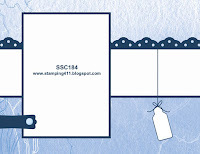 Be sure to stop over at the Stamping 411 blog and check them out, ok? But only after you read to the end and see who won my Blog Candy from last week! I had Emma choose a number between #1 and #158 (that's how many comments were left for the blog candy posts here) and she chose #63. Bet you didn't know I read your blog, too! Thank you for your Christmas post, and sharing that devotional. I pray that many who read it, realized for the first time what Christmas is all about. My favorite song for Christmas is Mark Lowery's "Mary, Did You Know?" As a mother, we can all look at our kids and think, "I wish I had known..." Imagine how Mary felt as Jesus grew, surely showing signs along the way that He was different, and when His ministry began those last three years of His life...healing, calming, performing miracles...just being the great I AM! Whew! I get goose bumps all over again. Love that song! Thanks for visiting Lynn and be sure to contact me privately with your address so I can get your Blog Candy out in the mail to you pronto! And I also wanted to say thanks to all of you who left a comment and shared so many beautiful compliments, thoughts and recollections with me. You touched my heart immensely this past week and it was a great reminder as to why I keep my blog - it's to maintain contact with you and share what I love so much! Wishing you a blessed New Year with all the good things life can hold! 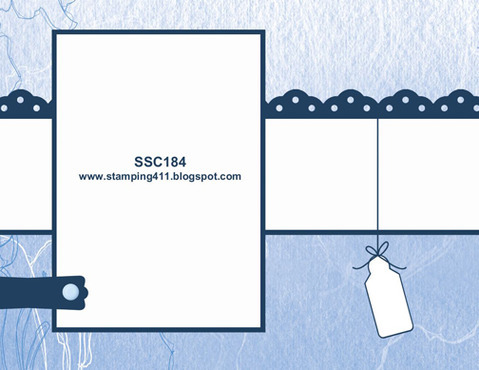 May it be full of stamping and joy! YOu may think it's busy....I think it's wonderful! great job as always Robin. Happy New Year and see you soon.. I think your card is awesome! thanks for sharing and happy new year. I love the card, Robin. I think it looks fun rather than busy. As a matter of fact, I think I'll have to go ahead and get that bundle. I've been on the fence. Oh and the letterpress, too. Dang, there goes my budget! LOL Happy New Year! Oh I don't even know where to begin with the things I love on this card Robin...for sure the adorable little bundle of tags, glitter, glimmer brad...okay, ALL of it!! Glad you had a good night with your friends. I was laughing when I read about you wondering what to do with yourselves, because that is SO Jeff & I too...we get all excited about a night to ourselves, then we're lost without the boys! Happy New Year Hon! Loved the card, and thanks for sharing it. Super cute! Looking forward to seeing your smiling face at Leadership. I love this card and am going to make a version of it to show my gals. Thank you for all the sharing that you do. I don't think it's busy at all. It's a fabulous card!!! This card is just beautiful Robin!!! You did an awesome job with this sketch!! Such a sweet Valentins - love the pink/red mix! Gorgeous, gorgeous card! See you soon! This is absolutely gorgeous Robin! I love all the white and red! So pretty!